The Atlantic Charter was a pivotal policy statement issued during World War II on 14 August 1941 which defined the Allied goals for the post-war world. The leaders of the United Kingdom and the United States drafted the work and all the Allies of World War II later confirmed it. The Charter stated the ideal goals of the war: no territorial aggrandizement; no territorial changes made against the wishes of the people (self-determination); restoration of self-government to those deprived of it; reduction of trade restrictions; global cooperation to secure better economic and social conditions for all; freedom from fear and want; freedom of the seas; and abandonment of the use of force, as well as disarmament of aggressor nations. Adherents of the Atlantic Charter signed the Declaration by United Nations on 1 January 1942, which became the basis for the modern United Nations. The Atlantic Charter set goals for the postwar world and inspired many of the international agreements that followed the war. The General Agreement on Tariffs and Trade (GATT), the postwar independence of European colonies, and much more are derived from the Atlantic Charter. US President Franklin D. Roosevelt and British Prime Minister Winston Churchill drafted the Atlantic Charter at the Atlantic Conference (codenamed Riviera) in Placentia Bay, Newfoundland. They issued it as a joint declaration on 14 August 1941 at Naval Station Argentia although the United States would not officially enter the War until four months later. The policy was issued as a statement; as such there was no formal, legal document entitled "The Atlantic Charter". It detailed the goals and aims of the Allied powers concerning the war and the postwar world. Many of the ideas of the Charter came from an ideology of Anglo-American internationalism that sought British and American cooperation for the cause of international security. Roosevelt's attempts to tie Britain to concrete war aims and Churchill's desperation to bind the US to the war effort helped provide motivations for the meeting which produced the Atlantic Charter. It was assumed at the time that Britain and America would have an equal role to play in any postwar international organization that would be based on the principles of the Atlantic Charter. Churchill and Roosevelt began communicating in 1939; this was the first of their 11 wartime meetings. Both men traveled in secret; Roosevelt was on a ten-day fishing trip. On 9 August 1941, the British battleship HMS Prince of Wales steamed into Placentia Bay, with Churchill on board, and met the American heavy cruiser USS Augusta, where Roosevelt and members of his staff were waiting. 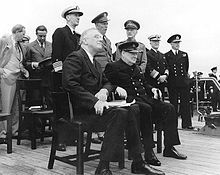 On first meeting, Churchill and Roosevelt were silent for a moment until Churchill said "At long last, Mr. President", to which Roosevelt replied "Glad to have you aboard, Mr. Churchill". Churchill then delivered to the president a letter from King George VI and made an official statement which, despite two attempts, the movie sound crew present failed to record. The Atlantic Charter made clear that the United States was supporting the United Kingdom in the war. Both the US and UK wanted to present their unity, regarding their mutual principles and hopes for a peaceful postwar world and the policies they agreed to follow once the Nazis had been defeated. A fundamental aim was to focus on the peace that would follow, and not specific American involvement and war strategy, although American involvement appeared increasingly likely. Although Clause Three clearly states that all peoples have the right to decide their form of government, it fails to say what changes are necessary in both social and economic terms, so as to achieve freedom and peace. Clause Four, with respect to international trade, consciously emphasized that both "victor [and] vanquished" would be given market access "on equal terms." This was a repudiation of the punitive trade relations that were established within Europe after World War I, as exemplified by the Paris Economy Pact. Only two clauses expressly discuss national, social, and economic conditions necessary after the war, despite this significance. When it was released to the public, the Charter was titled "Joint Declaration by the President and the Prime Minister" and was generally known as the "Joint Declaration". The Labour Party newspaper Daily Herald coined the name Atlantic Charter, but Churchill used it in Parliament on 24 August 1941, and it has since been generally adopted. No signed version ever existed. The document was threshed out through several drafts and the final agreed text was telegraphed to London and Washington. President Roosevelt gave Congress the Charter's content on 21 August 1941. He said later, "There isn't any copy of the Atlantic Charter, so far as I know. I haven't got one. The British haven't got one. The nearest thing you will get is the [message of the] radio operator on Augusta and Prince of Wales. That's the nearest thing you will come to it ... There was no formal document." The British War Cabinet replied with its approval and a similar acceptance was telegraphed from Washington. During this process, an error crept into the London text, but this was subsequently corrected. The account in Churchill's The Second World War concludes "A number of verbal alterations were agreed, and the document was then in its final shape", and makes no mention of any signing or ceremony. In Churchill's account of the Yalta Conference he quotes Roosevelt saying of the unwritten British constitution that "it was like the Atlantic Charter – the document did not exist, yet all the world knew about it. Among his papers he had found one copy signed by himself and me, but strange to say both signatures were in his own handwriting." The Allied nations and leading organisations quickly and widely endorsed the Charter. At the subsequent meeting of the Inter-Allied Council in London on 24 September 1941, the governments in exile of Belgium, Czechoslovakia, Greece, Luxembourg, the Netherlands, Norway, Poland, and Yugoslavia, as well as the Soviet Union, and representatives of the Free French Forces, unanimously adopted adherence to the common principles of policy set forth in the Atlantic Charter. On 1 January 1942, a larger group of nations, who adhered to the principles of the Atlantic Charter, issued a joint Declaration by United Nations stressing their solidarity in the defense against Hitlerism. The Axis powers interpreted these diplomatic agreements as a potential alliance against them. In Tokyo, the Atlantic Charter rallied support for the militarists in the Japanese government, who pushed for a more aggressive approach against the US and Britain. The British dropped millions of flysheets over Germany to allay fears of a punitive peace that would destroy the German state. The text cited the Charter as the authoritative statement of the joint commitment of Great Britain and the US "not to admit any economical discrimination of those defeated" and promised that "Germany and the other states can again achieve enduring peace and prosperity." The problems came not from Germany and Japan, but from those of the allies that had empires and which resisted self-determination—especially the United Kingdom, the Soviet Union and the Netherlands. Initially it appears that Roosevelt and Churchill had agreed that the third point of Charter was not going to apply to Africa and Asia. However Roosevelt's speechwriter Robert E. Sherwood noted that "it was not long before the people of India, Burma, Malaya, and Indonesia were beginning to ask if the Atlantic Charter extended also to the Pacific and to Asia in general." With a war that could only be won with the help of these allies, Roosevelt's solution was to put some pressure on Britain but to postpone until after the war the issue of self-determination of the colonies. Public opinion in Britain and the Commonwealth was delighted with the principles of the meetings but disappointed that the US was not entering the war. Churchill admitted that he had hoped the US would decide to commit itself. The acknowledgement that all people had a right to self-determination gave hope to independence leaders in British colonies. The Americans were insistent that the charter was to acknowledge that the war was being fought to ensure self-determination. The British were forced to agree to these aims but in a September 1941 speech, Churchill stated that the Charter was only meant to apply to states under German occupation, and certainly not to the countries who formed part of the British Empire. Churchill rejected its universal applicability when it came to the self-determination of subject nations such as British India. Mahatma Gandhi in 1942 wrote to President Roosevelt: "I venture to think that the Allied declaration that the Allies are fighting to make the world safe for the freedom of the individual and for democracy sounds hollow so long as India and for that matter Africa are exploited by Great Britain..." While self-determination was Roosevelt's guiding principle, he was reluctant to place pressure on the British in regard to India and other colonial possessions as they were fighting for their lives in a war in which the United States was not officially a participant. Gandhi refused to help either the British or the American war effort against Germany and Japan in any way, and Roosevelt chose to back Churchill. India was already contributing significantly to the war effort, sending over 2.5 million men (the largest volunteer force in the world at the time) to fight for the Allies, mostly in West Asia and North Africa. Churchill was unhappy with the inclusion of references to peoples' right to "self-determination" and stated that he considered the Charter an "interim and partial statement of war aims designed to reassure all countries of our righteous purpose and not the complete structure which we should build after the victory." An office of the Polish Government in Exile wrote to warn Władysław Sikorski that if the Charter was implemented with regard to national self-determination, it would make the desired Polish annexation of Danzig, East Prussia and parts of German Silesia impossible, which led the Poles to approach Britain asking for a flexible interpretation of the Charter. During the war Churchill argued for an interpretation of the charter in order to allow the Soviet Union to continue to control the Baltic states, an interpretation rejected by the US until March 1944. Lord Beaverbrook warned that the Atlantic Charter "would be a menace to our [Britain's] own safety as well as to that of the Soviet Union." The US refused to recognise the Soviet takeover of the Baltics, but did not press the issue against Stalin when he was fighting the Germans. Roosevelt planned to raise the Baltic issue after the war, but he died in April 1945, before fighting had ended in Europe. ^ Cull, pp 15, 21. ^ "President Roosevelt's message to Congress on the Atlantic Charter". The Avalon Project. Lillian Goldman Law Library. 21 August 1941. Retrieved 14 August 2013. ^ "Inter-Allied Council Statement on the Principles of the Atlantic Charter". The Avalon Project. Lillian Goldman Law Library. 24 September 1941. Retrieved 14 August 2013. ^ "Joint Declaration by the United Nations". The Avalon Project. Lillian Goldman Law Library. 1 January 1942. Retrieved 14 August 2013. ^ Joseph P. Lash, Roosevelt and Churchill, 1939-1941, W. W. Norton & Company, New York, 1976, pp. 447–448. ^ "Second World War Memorials". Commonwealth War Graves Commission. Archived from the original on 2 January 2013. Retrieved 14 August 2013. Beschloss, Michael R. (2003). The Conquerors: Roosevelt, Truman and the Destruction of Hitler's Germany, 1941–1945. New York: Simon & Schuster. ISBN 9780743244541. Brinkley, Douglas G.; Facey-Crowther, David, eds. (1994). The Atlantic Charter. Basingstoke, Hampshire, UK: Palgrave Macmillan. ISBN 9780312089306. Charmley, John (2001). "Churchill and the American Alliance". Transactions of the Royal Historical Society. Sixth Series 11: 353–371. ISSN 0080-4401. JSTOR 3679428. Cull, Nicholas (March 1996). "Selling peace: the origins, promotion and fate of the Anglo-American new order during the Second World War". Diplomacy and Statecraft. 7 (1): 1–28. doi:10.1080/09592299608405992. Gratwick, Harry (2009). Penobscot Bay: People, Ports & Pastimes. The History Press. ISBN 9781596296237. Gunther, John (1950). Roosevelt in retrospect: a profile in history. New York: Harper & Brothers. Hein, David (July 2013). "Vulnerable: HMS Prince of Wales in 1941". Journal of Military History. 77 (3). Hoopes, Townsend; Brinkley, Douglas (2000). FDR and the Creation of the U.N. New Haven, CT: Yale University Press. ISBN 9780300085532. Kimball, Warren (1997). Forged in war: Churchill, Roosevelt and the Second World War. New York: HarperCollins. ISBN 9780062034847. Langer, William L.; Gleason, S. Everett (1953). The Undeclared War 1940–1941: The World Crisis and American Foreign Policy. Harper & Brothers. ISBN 978-1258766986. Lauren, Paul Gordon (2011). The Evolution of International Human Rights: Visions Seen. U of Pennsylvania Press. ISBN 978-0812221381. Louis, William Roger (Summer 1985). "American Anti-Colonialism and the Dissolution of the British Empire". International Affairs. 61 (3): 395–420. ISSN 0020-5850. JSTOR 2618660. Louis, William Roger (2006). Ends of British Imperialism: The Scramble for Empire, Suez and Decolonization. London: I.B.Tauris. ISBN 9781845113476. Louis, William Roger (1998). More adventures with Britannia: Personalities, Politics and Culture in Britain. London: I.B.Tauris. ISBN 9781860642937. O'Sullivan, Christopher D. (2008). Sumner Welles, Post-War Planning and the Quest for a New World Order 1937–1943. New York: Columbia University Press. ISBN 9780231142588. Prażmowska, Anita (1995). Britain and Poland, 1939–1943: the betrayed ally. Cambridge, UK: Cambridge University Press. ISBN 9780521483858. Sauer, Ernst (1955). Grundlehre des Völkerrechts, 2nd edition (in German). Cologne: Carl Heymanns. Smith, Jean Edward (2008). FDR. New York: Random House LLC. ISBN 9780812970494. Sathasivam, Kanishkan (2005). 'Uneasy Neighbors: India, Pakistan, and US Foreign Policy. Surrey, UK: Ashgate Publishing, Ltd. ISBN 9780754637622. Stone, Julius (June 1942). "Peace Planning and the Atlantic Charter". Australian Quarterly. 14 (2): 5–22. ISSN 0005-0091. JSTOR 20631017. Weigold, Auriol (2008). Churchill, Roosevelt and India: Propaganda During World War II. Taylor & Francis US. ISBN 9780203894507. Wrigley, Chris (2002). Winston Churchill: A Biographical Companion. ABC-CLIO. ISBN 9780874369908. Wikimedia Commons has media related to Atlantic Charter. Letter from The Ambassador Patrick J. Hurley to the US Secretary of State TEHRAN, April 14, 1945. Describing meeting with Churchill, where Churchill vehemently states that the UK is in no way bound to the principles of the Atlantic Charter.